More CES offerings -- including "automating guilt." Another possible deal for subsidizing the cost of the watch. At this year’s CES, products to help older people with daily life and health issues. Run-through of technologies that can be helpful to older adults. Fewer software platforms, but new and more interesting offerings. Two major changes happened in 2018 that are having and will continue to help older adults. First there is the significant uptake of voice-enabled technology, was forecast to be transformative, and so it was, in senior living, in the homes and families of seniors, and as an interface in newer cars to make giving and hearing directions easier. Not so newsworthy, but perhaps more important, the hearing technology industry and audiologist specialty were disrupted in favor of self-service and offerings at a significantly lower cost. Among other efforts, senior living communities nationwide began their journeys into smart homes. Describes changes that will impact seniors, families, and senior living. Home care companies increasingly are requiring non-compete agreements. Who can and will be talking to their technology? Quite a few people will, though it is hard to get a real number – which is ironic, since Amazon, Google, Apple, Samsung, etc. all know how many they have shipped. And they also know how many devices are back-ordered. Maybe believe this one: could there be 50 million smart speakers in US possibly with some homes having more than one)? 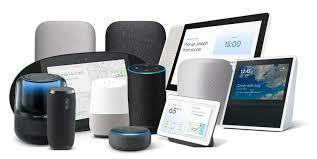 On the other hand, according to Pew Research, only 66% of the 65+ population (46 million) have broadband access (that is, high enough speed) to enable a smart speaker in the home. Perhaps non-users are in rural areas. Or they live in parts of regions, according to Microsoft, that are significantly overstated by the FCC as having broadband.